Radiators are a type of home heating system that involves heating elements that are mounted on the sides of the walls of the rooms of your home. The heating elements can be hot water pipes, which provide heat by circulating hot water or steam through the pipes. If you have a hot water or steam Radiator system, then you will also have a Gas or Oil Boiler (and you should put a checkmark for this home feature in your Home Wizard app). Or the heating elements can be electric, which provide heat by running an electric current through the heating element. Radiators are similar to, but different than, Baseboard Heat. 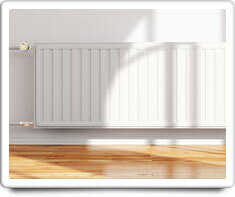 Like Radiators, Baseboard Heat may also be heated by circulating hot water (or steam), or they may be electric. But Radiators are mounted on the side of the wall, while Baseboard Heat is mounted along the bottom of the wall near the floor. Air bubbles in the circulating hot water sometimes collect in the radiator and this takes up space that would otherwise be filled with hot water. Therefore, this air must be bled off to allow the radiator to give off the most heat. Baseboard Heating and Furnace (gas). Shown in the 'Routine Care' section are the recommended routine maintenance tasks for your radiators. The 'Q & A' section shows answers to common questions. And the 'Articles' section provides helpful articles about your radiators.